It's been awhile since hubby and I had a movie date. With all the fuss moving in to a new home and then taking care of his niece, last year was one heck of a ride. Anyways, we enjoyed watching Thor in ATC last Sunday. I'm not expecting to watch it in 3D but since there's only one cinema available for Thor and it happens to be in 3D, we give it a go. Quick comparison of 3D cinemas, the first time hubby and I watched 3D was in Trinoma. It was the last installment of Narnia (sorry forgot the title). Since it's our first time, we are in awe. Then here comes the second experience of watching another 3D film. This time the screen is clearer or maybe it is the 3D eyeglasses? Or maybe the quality of the picture itself? I dunno the exact reason but I enjoyed watching Thor in ATC. It's just disappointing that the film is not a full-blown (aka 100%) 3D. 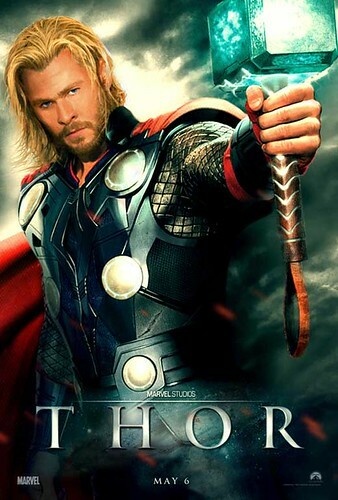 Back to Thor, Chris Hemsworth is one heck of a hunk! I think he portrayed the role well though I'm not an avid reader of Marvel comics, I enjoyed the film and I can't wait for the second part to be shown in two years (for sure). According to my friend who is a fan of Marvel, the Thor comics is more action packed compared to the film. Well obviously, it's much easier to draw the characters rather than directing and acting them in real life especially we know that such person doesn't exist. Another point is the character of Natalie Portman. I dunno if she's part of the Thor comics since my husband is asking the presence of Natalie's character on the film. Maybe I should ask my Marvel SME friend about Jane. Next stop is Fast 5. This is one of the few films that I want to watch in 3D, that is if it's available in that fornat in ATC. Then followed by Kung Fu Panda 2 which I saw the trailer in 3D and it's awesomeness! I was planning to watch this with hubby and my siblings so they can experience watching movies in 3D. I'm sure they will be gobsmacked by the technology...hehehehe.